Photo source: Copyright © Caleb Project. Used with permission. The Levant Arabs originally settled all over the Arabian Peninsula and later migrated to North Africa. Today, several hundred thousand Levant Arabs live along the northern edges of the Arabian Desert. They are spread from Israel to Kuwait and as far east as Iran. 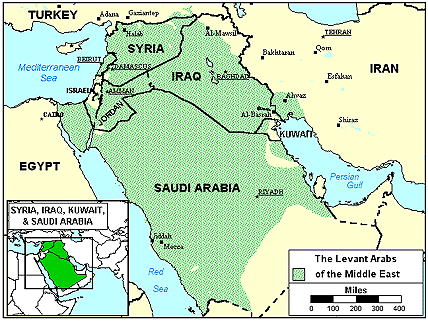 "Levant" is a broad term that includes several groups of Arabs: the Jordanian, Palestinian, Iraqi, Chaldean, and Syrian Arabs. Arabs from the Arabian Peninsula are considered to be the original Arabs. The Arabian culture was developed by tribes of nomads and villagers who lived in the Arabian Desert for many centuries. It was also from there that Arab migrations began, eventually leading to the expansion of the Arab world. The Levant Arabs have had a close association with Islam throughout much of their history, and today, nearly all of them except for the Jewish Arabs are Muslims. The two main branches of Islam in the region are the Shi'ites and Shafiites. Most Levant Arabs speak an Arabic language called Arabiya, with varying local dialects. Others speak an Arabic language known as Mashriqi. The Levant Arabs typically live in villages located near fertile regions; but they can also be found near mountain foothills in less arid regions. Although they have settled in towns or villages, they have held on to their tribal affiliations. The various tribes are ruled by sheiks (Arab chiefs that are considered to be experts in Islam and in relating to the outside world). Their fortress-like villages can be easily defended. Each house has windows on all sides and is built facing the outside of the village. All goods and persons passing through town are strictly controlled. Individual dwellings tend to be elaborately decorated, flat-roofed homes called "town houses." Lime wash and brickwork are used around the windows as a form of artistic design. The rooms usually have some type of carpeting, and when entering the house, one must leave his shoes at the door. The walls are lined with mattresses and cushions to sit on and lean against. A main reception room and a kitchen are located on the top floor. The flat roofs are used by the women for drying laundry. Social life is very important to Arabs. They like to share a daily coffee time by sitting on the floor and drinking coffee from cups without handles. Their diet basically consists of wheat bread and porridge made with boiled meat or chicken. Despite Islamic teachings, the reality of different classes of Arabs still persists. The type of clothing worn has become one of the determining factors. Levant tribesmen dress differently than other villagers and can be easily recognized. The women wear veils both in town and at home. Boys show that they are becoming men by changing their headgear and wearing daggers. In spite of the fact that some Muslims are allowed to have up to four wives, most marriages among the Levant Arabs are monogamous. In the past, all marriages were arranged by the parents; however, it is becoming more acceptable for young people to choose their own mates. Young girls are considered ready for marriage by age nine. In recent years, many of the Levant Arab nomads have settled into mountain villages where they now raise grains, vegetables, coffee, melons, dates, mangoes, and pomegranates. Domestic animals are kept to supply milk and eggs. Almost all Levant Arabs are Muslims. Islam is a religion of works that is based on five basic "pillars." (1) A Muslim must affirm that "there is no god but Allah, and Mohammed is his prophet." (2) He must pray five times a day while facing Mecca. (3) He must give generously. (4) He must fast during Ramadan, the ninth month of the Muslim year. (5) He must try to make at least one pilgrimage to Mecca in his lifetime. Islam has greatly influenced the lives of the Levant Arabs. To preserve their people, they are only allowed to marry those inside their own group. Levant Arab society is patrilineal, which means that inheritances are passed down through the males. In this system, boys inherit more than girls. Since children are considered a family's greatest asset, females are valued for their ability to bear children. There is a great need for the Gospel to be preached among the Levant Arabs. At the present time, there are only a few Christians within the Levant Arab community, with the largest number found among the Iraqi Arabs. Evangelization efforts among these tribes are challenging due to restrictions in many of the countries, as well as general antagonism towards Christianity. Prayerful intercession is the key to reaching them with the Gospel. * Pray that God will raise up faithful intercessors who will stand in the gap for the Levant Arabs. * Ask God to give Levant Arab believers opportunities to share the love of Christ with their own people. * Pray that their traditional Muslim culture will soften, creating open doors for the Gospel to be preached among them. * Ask the Holy Spirit to open the hearts of these people toward Christians so that they will be receptive to the Gospel. * Ask the Lord to raise up strong local churches among the Levant Arabs. * Pray for completion of Bible translation in this people group's primary language. * Pray for the availability of the Jesus Film in the primary language of this people.View Arab, Syrian in all countries.